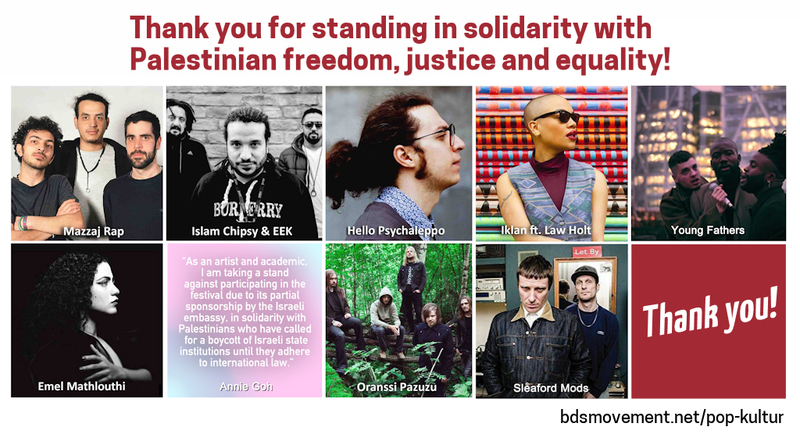 The Palestinian Campaign for the Academic and Cultural Boycott of Israel (PACBI) condemns the Pop-Kultur festival for spreading outrageous lies about the Boycott, Divestment and Sanctions (BDS) movement for Palestinian rights in a desperate attempt to divert attention from its shameful acceptance of Israel's sponsorship and its resultant complicity in whitewashing Israel's regime of occupation and apartheid. Frustrated that its insistence on accepting sponsorship from Israel, despite its egregious human rights violations, led to the withdrawal of all Arab artists, the Pop-Kultur organizers claimed that the goal of the cultural boycott of Israel is "to boycott completely any cooperation with Israeli artists and intellectuals." This is a straight lie. BDS, which is called for by the overwhelming majority of Palestinians, including artists, calls for an institutional boycott of Israel and institutions that are complicit in its denial of Palestinian human rights. It does not target individuals. Palestinians are appealing to all conscientious artists to boycott Israel as many had boycotted apartheid South Africa. Many leading Jewish artists and intellectuals, including Israelis, have endorsed the cultural boycott of Israel as a form of nonviolent pressure to bring about an end to its policies of military occupation, institutionalized racism, ethnic cleansing, siege and denial of refugee rights. PACBI's objection to this year's edition of Pop-Kultur was explicitly mentioned in the statement released by the campaign two days ago: "We call on all participating artists to be on the right side of history, the side of the oppressed, by cancelling their performances unless the festival rescinds this shameful [Israeli] sponsorship."